romance for the modern age. In Maurel’s sumptuously drawn time-travel fantasy, teenage Luisa is transported from the 1990s to the present to meet her 30-something self. Tamaki (This One Summer) adapts the translated French with freshly worded dialogue . . . In stand-out art, Maurel renders attractive characters with open, emotive faces and detailed Paris streets drenched in sunset-toned watercolors. There couldn’t be a lovelier setting for this winning story of romantic self-discovery. A funny, touching, and beautifully illustrated and colored story about self-acceptance with equal appeal to adult and YA audiences. "It’s not just the best comic I’ve read in years, it’s the best book I’ve read in years. It moved me deeply and uses the medium brilliantly. Highly recommended." "Luisa tackles familiar queer coming-of-age themes with a time-travel device that makes it perfectly suited to the comic medium." Maurel’s painterly, naturalistic artwork, in sumptuous full color, beautifully conveys the story. . . . should resonate with plenty of readers. 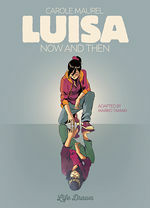 "Luisa: Now and Then is a powerful story that anyone who may be questioning their ability to accept themselves should read. . . . I would highly recommend this graphic novel." A graphic novel masterpiece throughout its 272 pages, Luisa is a modern coming-of-age tale without compromise which confirms the talent of Carole Maurel, a cartoonist whose every stroke is full of energy, emblematic of her generation. An unlikely encounter brilliantly told by a talented cartoonist. A singular narrative that is authentic, thought-provoking, intimately touching, sensitive yet funny. Flawless.